A superhero comic for superhero fans and non-superhero fans alike. What happens when Clint Barton, the Avenger known as Hawkeye, is put in charge of an apartment building in Brooklyn? It seems like bad luck seems to follow him wherever he goes. If it weren't for his dog Lucky and protege extraordinaire Kate, he'd be in worse shape than his heavily-bandaged face already lets on. Witty dialogue, wonderful artwork - this comic has something for everyone. The breakout star of this summer's blockbuster Avengers film, Clint Barton - aka the self-made hero Hawkeye - fights for justice! With ex-Young Avenger Kate Bishop by his side, he's out to prove himself as one of Earth's Mightiest Heroes! SHIELD recruits Clint to intercept a packet of incriminating evidence - before he becomes the most wanted man in the world. You won't believe what is on The Tape! What is the Vagabond Code? 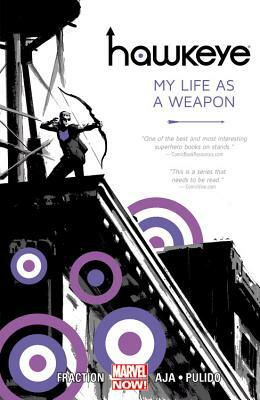 Matt Fraction pens a Hawkeye thriller that spans the globe...and the darkest parts of Hawkeye's mind. Barton and Bishop mean double the Hawkeye and double the trouble...and stealing from the rich never looked so good.